HD ports are more complex than they seem. 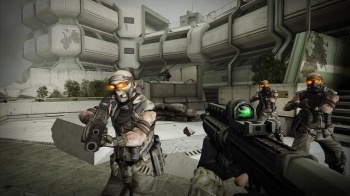 Despite being hyped as the PlayStation 2's "Halo Killer" - a phrase which still causes a nostalgic smidgeon of bile to rise in my throat - Guerilla Games' Killzone wasn't the mega hit many expected. Despite a lukewarm reception from critics, the game did sell enough to warrant two substantially better sequels and a spinoff. The game that started it all was consigned to history and its assets left to slowly erode in a shoebox. No really; a shoebox. That made life difficult when Guerilla decided the game warranted a HD re-release. According to an interview with Technical Director, Michiel Van Der Leeuw, and Sensior Programmer, Frank Compagner, digging up the game's code and assets was an adventure unto itself. The team had to engage in some "software archeology." "It's a programming term," explained Van Der Leeuw. "The biggest challenge we faced with regard to obtaining the assets was that Guerrilla's whole way of working was different back then. The assets had been backed up to tape at one point, but that was almost eight years and two tape robots ago. So we needed an archeologist, someone to dig into the depths of our backup archives and unearth whatever they could." It then turned out that the tapes containing the assets were being stored "offsite." "By which I mean, in a shoebox in the cellar of one of our IT support staff members, without a list of contents of any kind," added Compagner." The team eventually discovered a document with tape numbers and backup dates which matched the tapes in the shoebox, which then allowed them to pick out the tapes with the assets on them. Developer Hyjinx ran into a similar problem when working on Silent Hill HD Collection. Apparently, Konami hadn't kept up to date backups of the game, meaning the developers had to work with buggy, unfinished code. Unlike Guerilla Games' story, that one didn't have a happy ending.